In the security world, the bad guys and their malicious activities are frequently the center of attention. We think it’s time to shed some light on the good guys--the Security Analysts—and what a day in the life is like for them. 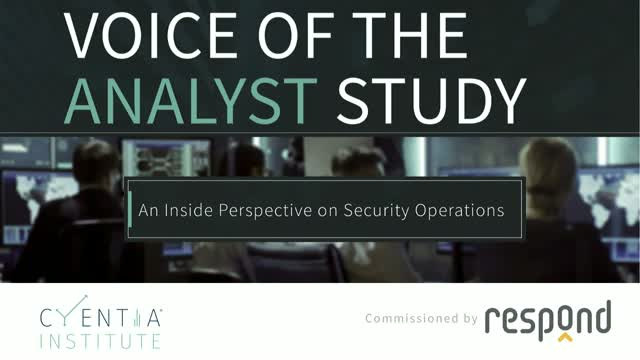 The 2017 Cyentia “Voice of the Analyst Study” is the first report to give the security analyst a collective voice that reveals new insights about their jobs and how this might affect a security operations center. Security analysts are our most critical resource, and often one of the organization’s largest operational costs. While these analysts are on the front line of cyber defense, it may be unclear how they spend their time and how they view their role. Join Wade Baker, Cyentia Institute Founder and Chris Calvert, VP Product Strategy and Co-Founder, Respond Software as they share the surprising results of the survey, including security analysts' opinions about catching the bad guys and what needs to change in their work environment so they can be more effective in their role. Web filter logs contain valuable security data that can be used to recognize adversaries within your network. This data is a top source for incident responders and forensic investigations -- once an attack has already been identified. However, the size and complexity of this data makes it nearly impossible to analyze and monitor, let alone to be able to do this in real-time. Respond Analyst is the first security decision automation solution that brings this data to frontline analysis where it’s more valuable. Real-time analysis and triage of web filter data, during network and endpoint analysis, gives security teams an edge in reducing response times and limiting the impact of some of the most stealthy attacks. - Discover the value of analyzing web filter logs in real-time. - Learn how the Respond Analyst’s Intelligent Decision Engine uses probabilistic reasoning to correlate security data for faster and more accurate escalations. - Get details on Respond Analyst’s low impact proof of concept workshop to experience the increased capacity and capability of adding autonomous decision-making to your team. Feeling like you can’t keep up with the volume of your Palo Alto IPS events? You’re not alone. Nearly every team feels the pain of a mountain of data and an ever decreasing amount of time to accurately review alerts. Luckily, there are solutions to analyze alerts so you find those that are truly malicious and actionable - with only an out-of-the-box expert system. Join our 30 min webinar to learn how adding Respond Analyst to your team automates the analysis and triage of every Palo Alto Network IPS/IDS event and sends only vetted, security incidents to your team. 1. Understand why every IPS event is important for security analysis, even those events reported as low or medium severity. 2. See how expert systems, like Respond Analyst, reliably take over the task of monitoring and triage so you can move on to other tasks and projects. 3. Discover a path forward that enables your team to receive significantly more value out of existing technology investments without building time-consuming correlation rules and queries nor reviewing alerts. Can virtual analysts save security teams from drowning in a sea of event data? Join our webinar to see how the Respond Analyst uses its superpowers to analyze network and endpoint data and piece together clues that indicate an actual security situation is occurring. Using real customer examples, you will see how the Respond Analyst is a lifeline for under-resourced security teams delivering vetted, documented security situations for response, rather than monitoring individual events and chasing false-positives. Join Chris Calvert and Steven Wimmer as they discuss the importance of context in security operations decision-making and how clues may be hiding in your security data. Using data from recent customer deployments, you will see how two organizations improved their analysis coverage and reduced cost by replacing their current MSSP relationship. 3. Walk-through two case studies where Respond Analyst reduced bottom-line costs while improving security performance. Security teams are challenged with the time-consuming task of console monitoring and creating content to keep up with new types of threats and alerts. Get more value from your ArcSight deployment by automating repetitive tasks and freeing up security analysts to hunt and investigate actual threats. The Respond Analyst is an AI-based expert system that works with ArcSight to automatically evaluate, scope, and prioritize events. Using a patent-pending Probabilistic Graphical Optimization (PGO™) technology that goes beyond rules-based algorithms, the Respond Analyst delivers more accurate, consistent, and scalable results to help you get more value from your ArcSight deployment. Join us and learn how security teams in large and small SOCs today are realizing the full value of their ArcSight deployment with the Respond Analyst. Respond Software redefines Security Operations with the first security expert system, The Respond Analyst. Driven by its patent-pending Probabilistic Graphics Optimization (PGO) technology, Respond Analyst emulates the decision-making of an expert security analyst, effectively becoming a SOC team member that specializes in high-volume, low signal use cases while it applies, adapts and maintains an organization’s tribal knowledge 7x24x365. Respond Software was founded by security operations veterans and world class product technologists to serve its customers across multiple industries.